Now you can try our famous Besame Red Lipstick! Each matchbook includes 5 sticks. Use each stick up to 3 times, enough for 15 full lipstick applications. Packaged in a vintage matchbook they are perfect for travel and sharing. 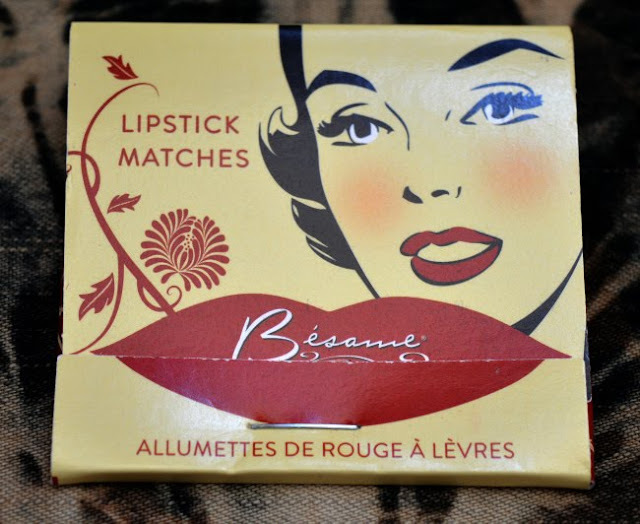 Whether you are discovering Besame for the first time or are a long time customer you will enjoy the simplicity and convenience of our lipstick matchbooks. One colors per sample, choose your favorites from 6 complementary color combinations. A semi-matte finish with one coat full coverage. The highest natural pigment content for a smooth, indelible, feather-proof finish. Enriched with squalene, vitamin C and aloe. Our vintage reproduction reds are the exact shades used by your favorite Hollywood starlets. Packaging : The packaging of these match lipstick is the only thing that attracted me to try these babies. They come packaged in a vintage matchbook and are perfect for travel or sharing. It contains 5 match sticks and is so cute. There's supposed to be 2 - 3 full application of lipstick on each match for on the go. I will say they actually contain enough color to reapply your entire lip look in a hurry plus they are small enough to even act as a lip liner. Formula & Texture : The formula is very creamy and glides on smoothly without any tugging and is adequately hydrating on the lips. The finish is a satiny matte that’s very classic. Color glides on beautifully and doesn’t tug during application plus it feels very lightweight and not at all drying. Pigmentation & Lasting : Besame’s formula is wonderfully rich in pigment and provides opaque color on a single application that wears for a solid five to six hours without fading, migrating, or feathering. Even after eating and drinking, the color faded a little BUT! all I had to do was press my lips together. Scent : It has a vanilla scent same with MAC lipsticks and Colourpop Lippie Stix. Price : The match book is sample sized of actual lipsticks and is priced 6 USD. What a fab idea. I think I'd buy these and not use them. I am not a makeup girl but even I love these and would be tempted to buy them. What clever packaging. The packaging looks cool! But the product looks drying on the lips. Never heard of the brand but the idea is great. Packaging is cute though. Never heard of this before. It looks like colorpop's previous formula. Isnt it? Good post and I am loving the products.